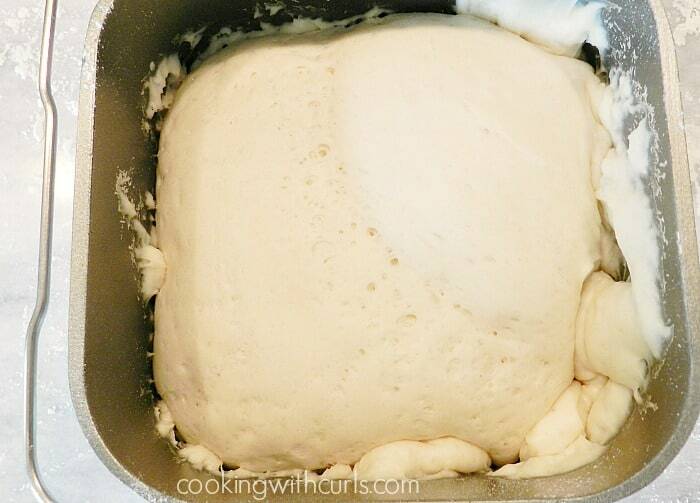 This is my go-to Homemade Pizza Dough recipe. It is simple to make, and so delicious! I even gave making pizza dough from scratch (without a bread machine) a try this week <insert applause>. I have had no real desire to make yeast dough from scratch, that is why I never have…before now. I was pleasantly surprised, it was nowhere near as hard as I had expected…..
Place the warm water and honey in the bowl of a stand mixer. Add the yeast, stir, and allow to sit for 5 – 10 minutes to allow the yeast to foam (proof)…..
Um well, it bubbled but it did not foam….but we’ll keep going. Add the oil, flour and salt to the bowl…..
and mix for 4 – 5 minutes, until fully incorporated…..
Hmmm, I underestimated the dryness of the desert. I added an additional tablespoon of water, but that is still too dry. 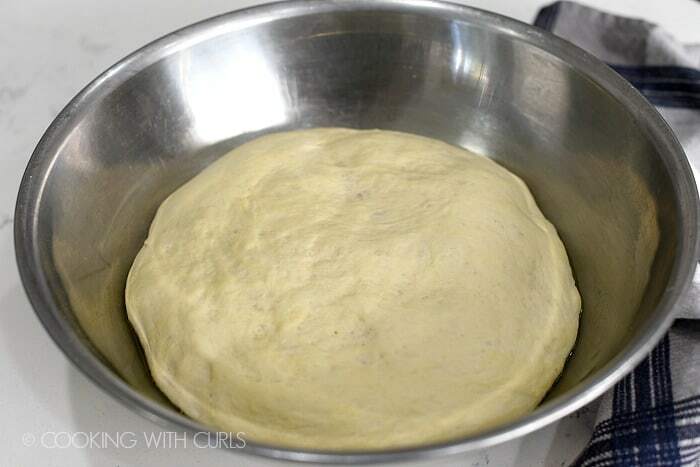 Place dough in an oiled bowl and flip it over so the oil is on top…..
Punch down the dough and divide into 4-pieces for individual pizzas or into 2-pieces for medium pizzas. Ideally the dough should be wrapped in plastic wrap and placed in the refrigerator for 24 hours to allow the gluten to relax…..
but if you are in the hurry, you can go ahead and use the dough immediately, like I did today…..
to take new pictures for a very old Chicken Enchilada Pizza post…..
Pour the water, honey, and oil into bucket/pan of dough machine…..
Add the salt and flour. 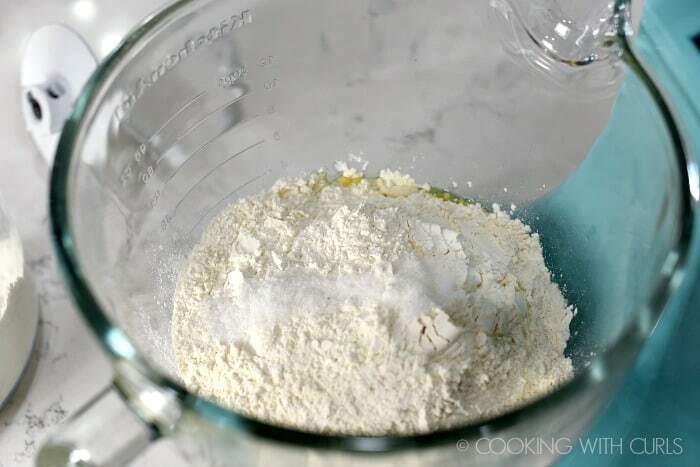 Make an indentation in the center of the flour, and add the yeast…. Place bucket/pan into dough machine and close lid. Turn on the machine, and select the “dough” setting. When the machine beeps, look thru the window and see how high the dough has risen. Do Not Open the lid, that will allow all of the heat to escape! If the dough is not more than halfway to the top, unplug the machine and allow dough to rise for an additional 30 – 60 minutes….. Remove the dough from the machine and roll into a ball. 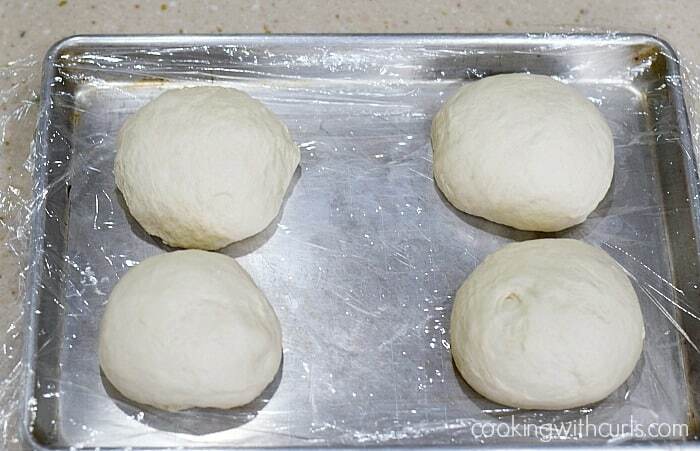 This will release the air bubbles…..
Cut the dough into 4-pieces for individual pizzas or into 2-pieces for medium pizzas…..
Set dough on a floured surface and allow to rest for 10 minutes. This will allow the dough to relax and roll out more easily. 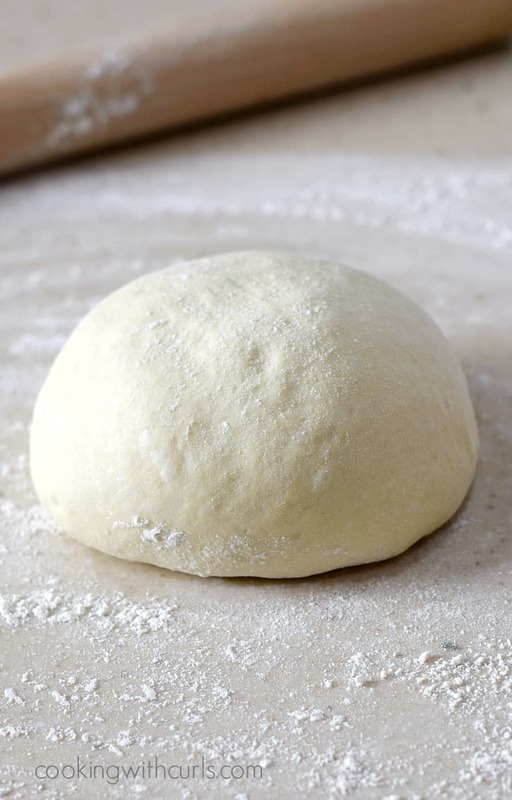 Roll dough to 1/4″ thickness in desired shapes…..
Place dough onto a cornmeal or parchment paper covered pizza peel or flat baking sheet and top as desired….. 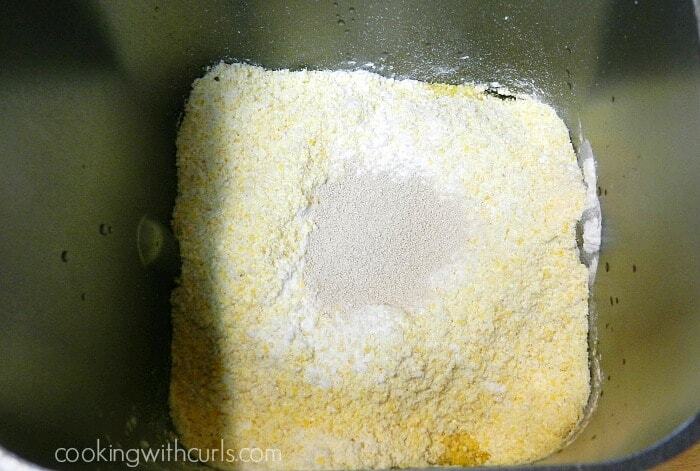 The cornmeal keeps the dough from sticking if you are using a baking stone. Now you are ready to make lots of pizzas!! The salt is added last so it does not kill the yeast! I use hot water because it is getting poured into a cold pan or bowl, which drops the temperature down quite a bit. You are looking for 110 – 115 degrees when you add the yeast. Parchment paper is cleaner than using cornmeal, but it is a personal choice. You cannot use parchment paper if you plan to use a grill pizza oven, it will burn and stick!! So there you have it. My favorite Homemade Pizza Dough prepared two different ways. I still prefer making it in my bread machine, but at least now I know I have another option. 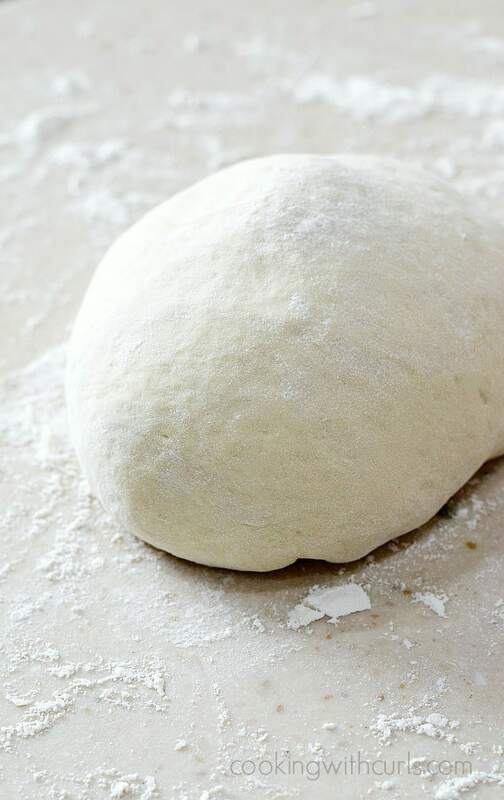 Homemade Pizza Dough is easier to make than you think, and I have step-by-step directions to help make the perfect pizza crust! 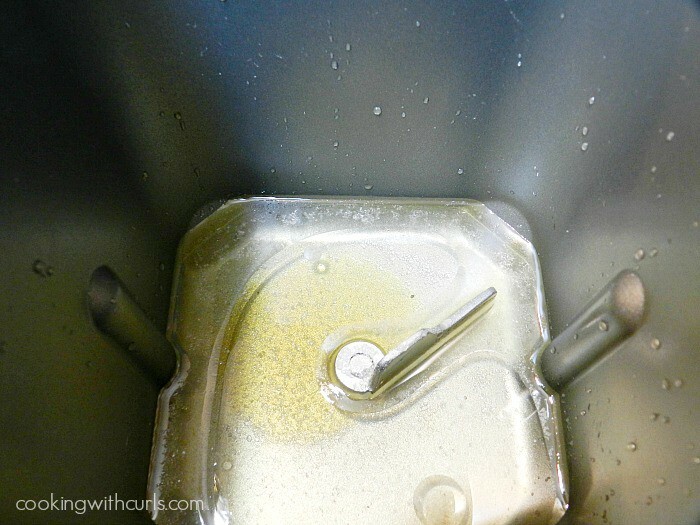 Place the warm water and honey in the bowl of a stand mixer. 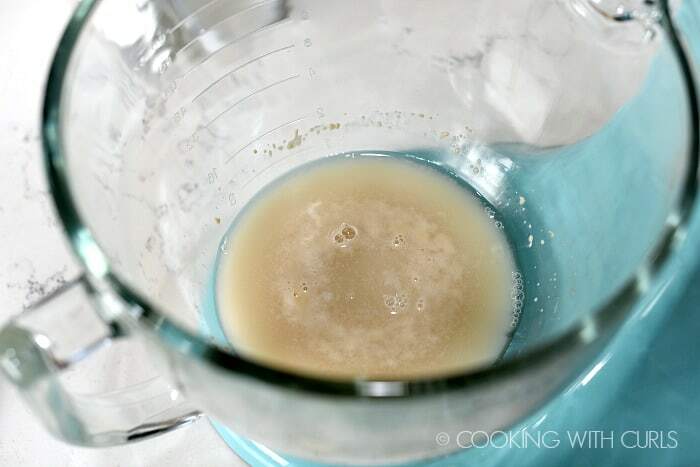 Add the yeast, stir, and allow to sit for 5 – 10 minutes to allow the yeast to foam (proof). Add the oil, flour and salt to the bowl and mix for 4 – 5 minutes, until fully incorporated. 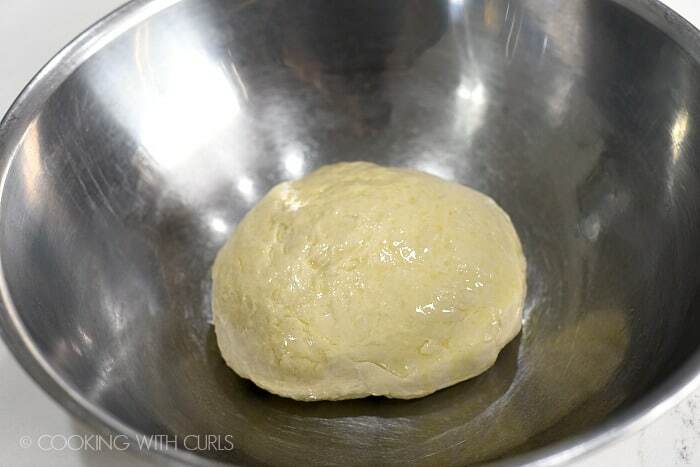 Place dough in an oiled bowl and flip it over so the oil is on top. Cover dough and allow to rise for 1 and a 1/2 hours, or until doubled in a draft free location. 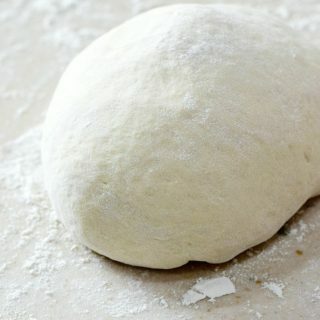 Ideally the dough should be wrapped in plastic wrap and placed in the refrigerator for 24 hours to allow the gluten to relax, but if you are in the hurry, you can go ahead and use the dough immediately. Pour the water, honey, and oil into bucket/pan of dough machine. Add the salt and flour. Make an indentation in the center of the flour, and add the yeast. When the machine beeps, look thru the window and see how high the dough has risen. Do Not Open the lid, that will allow all of the heat to escape! If the dough is not more than halfway to the top, unplug the machine and allow dough to rise for an additional 30 – 60 minutes. Remove the dough from the machine and roll into a ball. This will release the air bubbles. 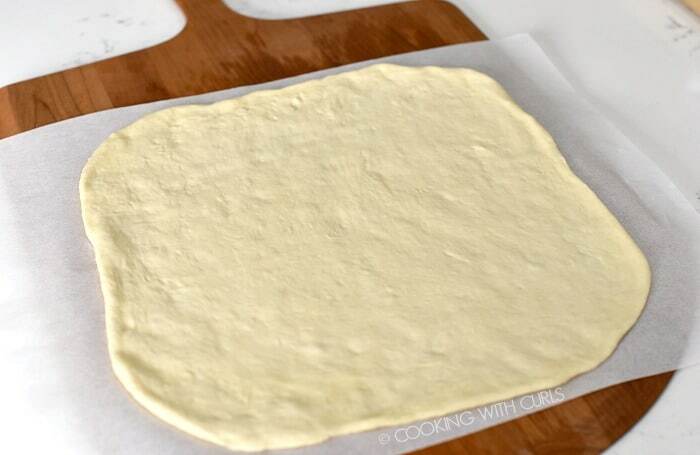 Cut the dough into 4-pieces for individual pizzas or into 2-pieces for medium pizzas. 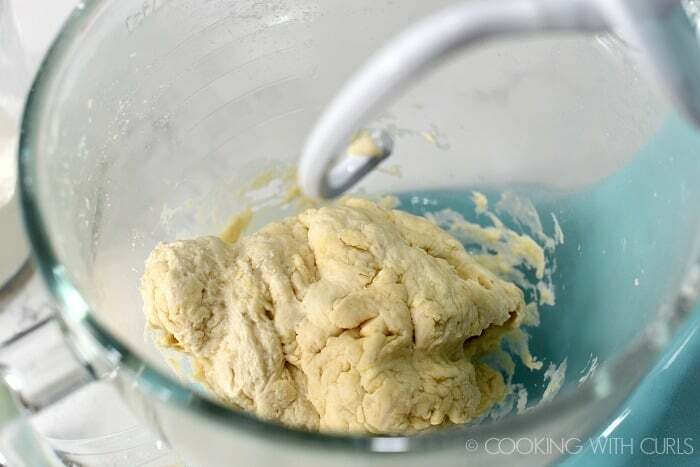 Set dough on a floured surface and allow to rest for 10 minutes. This will allow the dough to relax and roll out more easily. 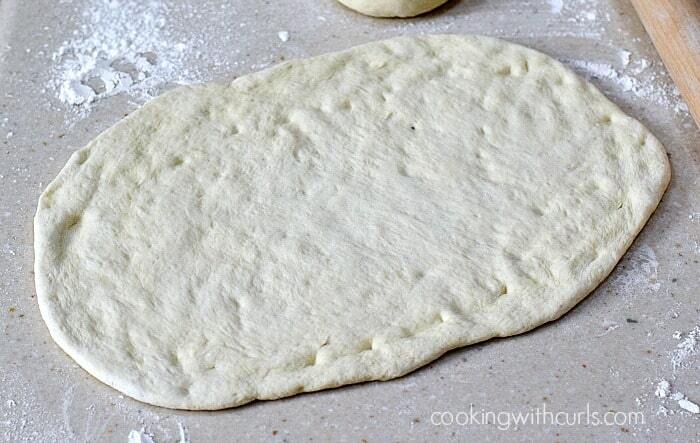 Roll dough to 1/4″ thickness in desired shapes. 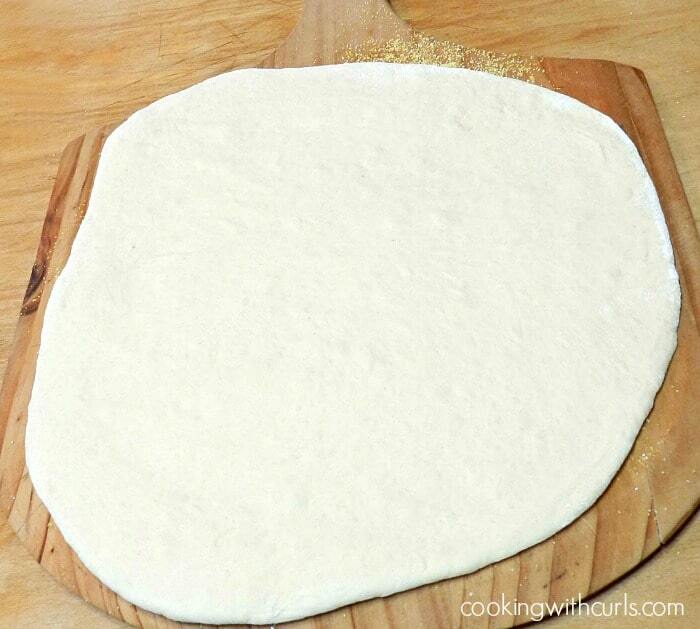 Place dough onto a cornmeal or parchment paper covered pizza peel or flat baking sheet and top as desired. 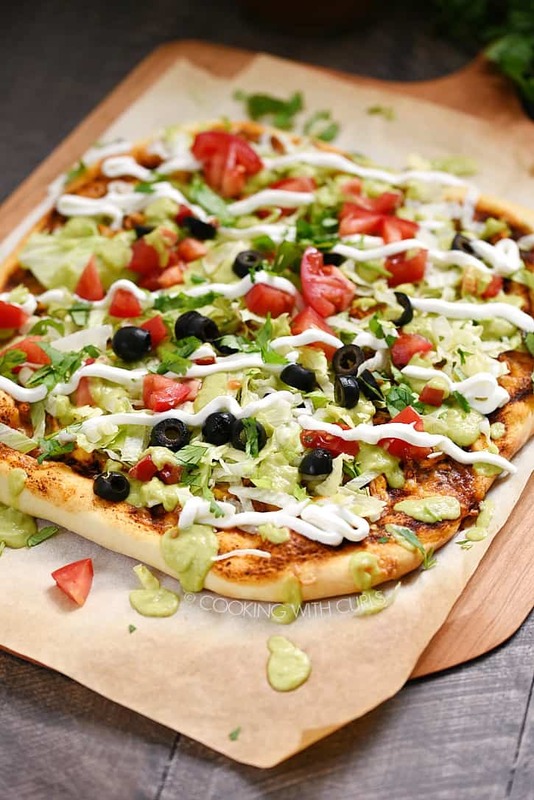 We love homemade pizza – and making any kind of yeast dough can be intimidating the first time 🙂 Glad you broke it down for people without a bread machine! Wow Lisa…I had no idea it was that easy to make pizza dough! Thanks for sharing directions without the bread maker as well. Homemade pizza is the best!!! Thanks for sharing at Sweet & Savory Saturdays #29. Have you tried freezing it?